The traffic data considered in this section run only to the end of the 2012 calendar year. While it is too early to draw firm conclusions, it is interesting to note at this stage that observed traffic data for 2013 are showing increases in traffic relative to 2012. If sustained, this could signify a break with the now long-established pattern of slowly declining levels of road traffic in London. That is, they seem to think motor traffic will start rising again in 2013. 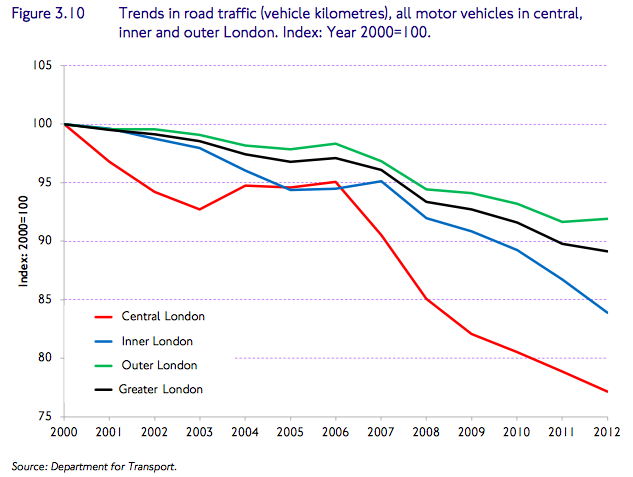 Certainly motor traffic in outer London (the green line) did rise by 0.3% in 2012, and this area accounts for 70% of all of London’s motor traffic. Time will tell. 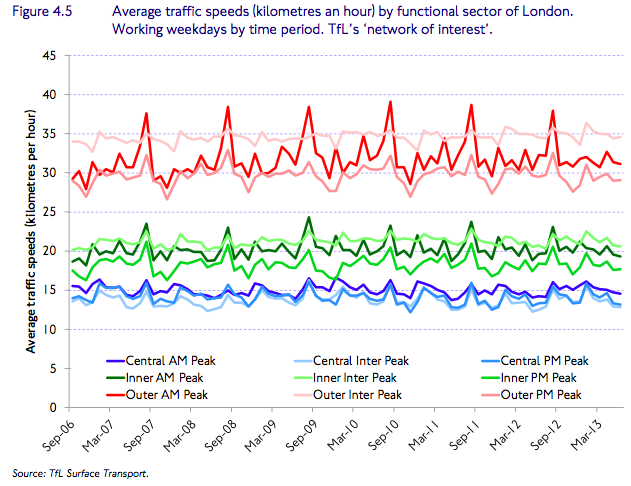 What is noteworthy is the remarkable consistency of vehicle speeds in the different areas of London over the last seven years. It just hasn’t budged, despite ‘smoothing traffic flow’ and all the attempts to fiddle with signal timings. There’s been no change – average traffic speeds in central London still hover around 9mph, and around 12mph for inner London. The biggest changes are actually seasonal, with speeds increasing in the summer as demand dips. The picture for cycling isn’t particularly pretty. Slow but steady growth in outer London (the black line) has tailed off, while cycling levels in inner and greater London (green and red) actually declined last year. 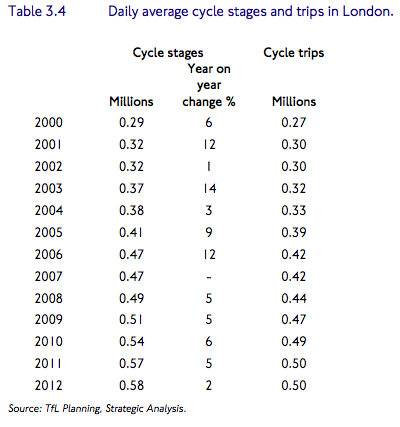 There were 582,000 cycle stages on an average day in 2012, which represents just a 1.8% increase on 2011. 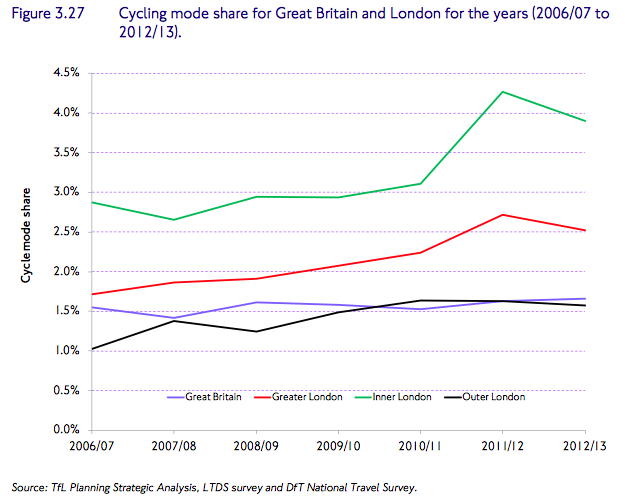 The majority of indicators of cycling in London suggest a slowing in 2012 of the recent high rates of growth. There are a number of reasons for the slowing in cycling growth. In addition to the weather, which can impact on cycle flows, delivery of new cycling infrastructure slowed in 2012/13 in the run up and during the Games period, following a moratorium on new project construction. Further, the implementation of the Better Junctions cycle safety review has impacted on the pace of delivery of major new cycle programmes, including both the Barclays Cycle Superhighway and Better Junctions programmes. and also that there is no clear relationship between rainfall and cycling levels. Some serious work is clearly needed even to attain the Mayor’s unambitious target of a 5% cycling mode share (for London as a whole) by 2026.
which is a shocking statistic for a mode of transport that is not intrinsically dangerous. 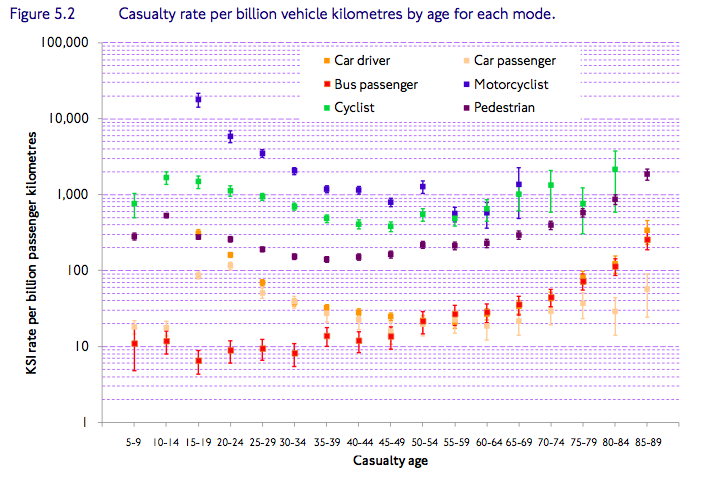 The report also includes this interesting graph, showing the casualty rate per distance traveled, by mode of transport in London, broken down by age group. By this measure cycling (represented by the green dots) is more hazardous than any other mode of transport, bar motorcycling, for all age groups. The casualty rate is particularly bad for teenagers cycling. The number of pedestrians who were killed or seriously injured (KSI) rose 15% in 2012, up to 1,123 from 980 in 2011. And the picture is just as bad for those cycling, with KSIs in 2012 up to 671, an enormous rise of 18% on the figure for 2011 – just 571. In fact, cycling KSIs in London are now up 55% on 2009, when there were 433 cycling KSIs. Obviously we should take into account the fact that more people are cycling, but it is now clear that the number of KSIs is outstripping the increase in trips. 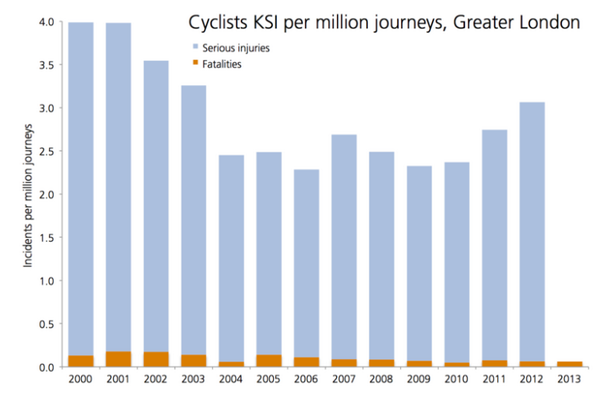 The risk of a cycling KSI per trip is now higher than any time since 2003, as this graph shows. The changes of policy that are proposed in the Mayor’s Cycling Vision are coming at exactly the right time, with danger increasing, and cycling levels apparently starting to stagnate. The question is now whether they can be delivered. This entry was posted in Andrew Gilligan, Cycling policy, Infrastructure, London, Road safety, Transport for London. Bookmark the permalink. the casualty rate per billion km graph doesn’t look too bad until you notice the logarithmic scale. i wonder how much of the recent increase in motor traffic is caused by boris’ removal of the western congestion charge zone? have you spotted, page 127, what amounts to the abandonment of the 5% modal share cycling target? then pages 128-130 theorize, on the basis of no actual evidence, that failure to reduce congestion and increase traffic speeds as weirdly forecast to result form some initiatives was probably the fault of re-allocation of road-space to cycling – the neanderthal gist being that we might have to tone down the cycling stuff in order to reduce congestion!!! See also page 239, tale 9.1 – of ten street types, cycling accessibility is listed as a primary objective for only one, high streets – this is the sole case in which preparedness to even *risk* motor congestion for other gains is indicated. In general, cycling is not mentioned at all on the Key Roads Task Force Objectives, except that for arterial roads “parallel routes” for “local traffic and cycling” are an objective (note the ‘and’), with “Traffic volumes (including walk/cycle)” marked as a success indicator. The success indicator is not cycle commute times, and note that these parallel routes would be marked as successful if walking and cycling on them did NOT increase, but local vehicular traffic did: “Traffic volumes (including walk/cycle)”; NOT “Traffic volumes, specifically walk/cycle”. otherwise table 9.1 gives priority to getting a “good environment” for cyclists in “connector” streets and a “high quality environment” in “city hubs”. note “high quality” is to be measured by traffic volumes (of cyclists? ), while “good” is to be measured by “Traffic volumes, for example freight, cycle”, the gist of which might be that a reduction in HGV throughput would be evidence that we don’t have a “good environment” for cyclists. I’m OK with the data and it’s analysis but, if these guys are going to release interpretations of the same, please, please, please could someone persuade them to do it only after thorough review by independent techincal experts, say a sister Dutch or Danish organization. You and David Robjant raise some issues (though I think David’s comments are a bit of an over-interpretation), here’s a couple more. On page 50 of the report it says “most cycle trips are commuting trips and school trips” – I mean, come again, pal?? Adding school trips to adult commuting is really not on, especialy where no data or references are given to indicate how significant the school trip component is to the statement. It’s like saying “most cycle trips are commuting trips and my aunt’s daily trip to the newsagents”. Some facts are given on page 196 where it says “Cycling trip rates (for schoolchildren) are relatively very low – much less than 0.05 trips on average per child per day” and this is illustrated on figure 8.8, a pie chart of modal share within school trips. You can see there that most active travellers are walking (I suppose this includes scooters – which I’d regard as part of the suppressed demand). The school holiday effect on morning traffic is also quite striking (and I’m pretty sure it would apply to adjacent Surrey too) and, when compared with figure 8.8, suggests that it only takes a relatively small proportion of cars being driven to take kids to school to make travel signifcantly worse for everyone else, including other motorists. For some reason, this is not noted explicitly in their interpretation, which instead uses the wonderful euphemism “expected seasonality”. PS. On over-interpreting the TfL report, I recommend anyone concerned about substance carefully reads page 127. My reaction to that page has a lot to do with my treatment of what followed, over-interpretation or otherwise. 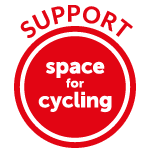 The whole drift of the press treatment put out at the beginning of the month – and the BBC is surely reprinting a press release – is to downplay cycling. But methinks RAC do protest too much: there are london boroughs in this data where cycles represent *over ten percent of all journeys to work* – in hackney 14.9% bike, 11.3% car, similar ratios in favour of the bike in islington & in the city of london, near parity in other boroughs. Admittedly those are census numbers and will be for commutes by pint of origin, but they’ve tried very hard to spin this. Boroughs used to collect figures on mode share using screen line counts twice a year I think – is this still happening?